I can't believe it has taken me so long to make it to Thai Nakorn when it's practically in my backyard. I live in Garden Grove for goodness' sake! 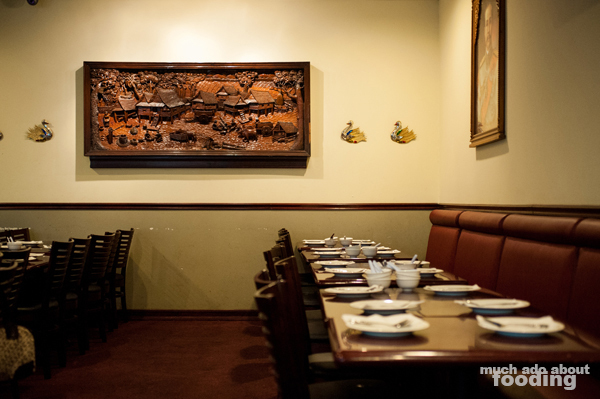 I've heard from several people that this is the best place to get Thai food in the area but for some reason have not been nearby whenever the Thai food craving strikes. However, circumstances changed one night, and we found ourselves seated at a table with two other friends, listening to just about the entire spectrum of music (classic Thai music which shifted to alternative rock which shifted to electronic/trance...?) and ready to indulge. To start, we opted for a steaming hot pot of Tom Yum Kah Gai (ต้มข่าไก่ - Laotian chicken soup with coconut milk) with shrimp. I love how Asian restaurants tend to serve their soup in the heated containers with burners underneath - it really helps everything stay nice and warm. 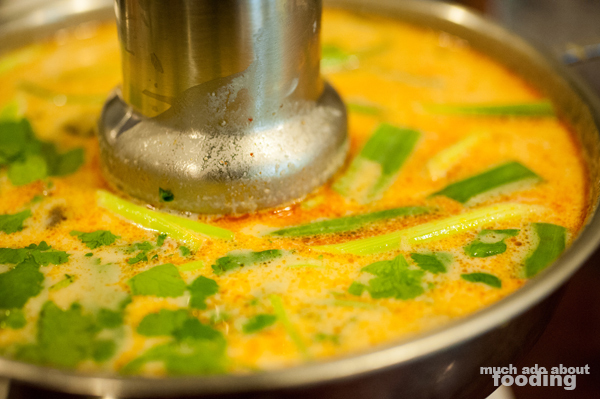 Our soup was pleasantly tangy from all of the lime and kaffir leaves but still savory from the rich coconut milk. 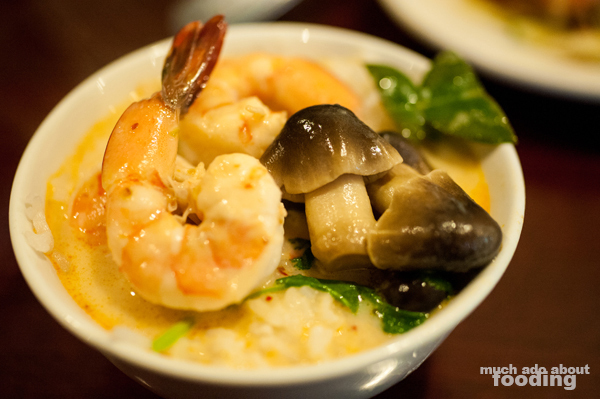 The abundance of soup ingredients helped a lot too, especially the straw mushrooms and many shrimps we found. 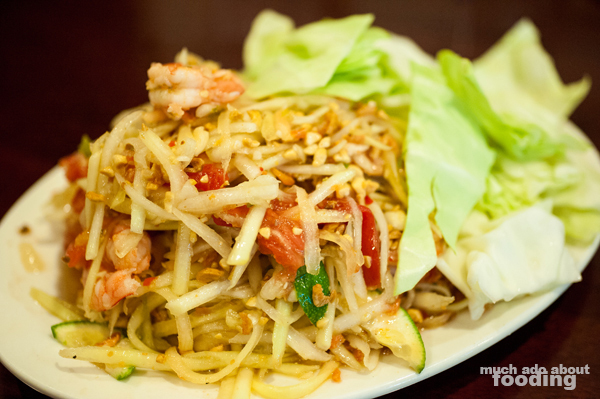 (I couldn't find the exact listing on the online menu for the salad name) I always have to order the Papaya Salad at any Thai restaurant and with shrimp. Wow was this one spicy! It didn't just have a kick to it; this was almost a full-on Chuck Norris roundhouse to the tastebuds. 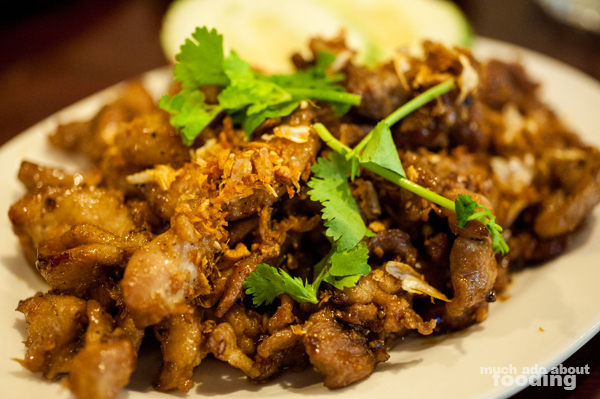 It hit us all but the addictive crunchiness from the green papaya & peanuts and the fish sauce had us back for more. It was difficult to finish though so we boxed this one up. 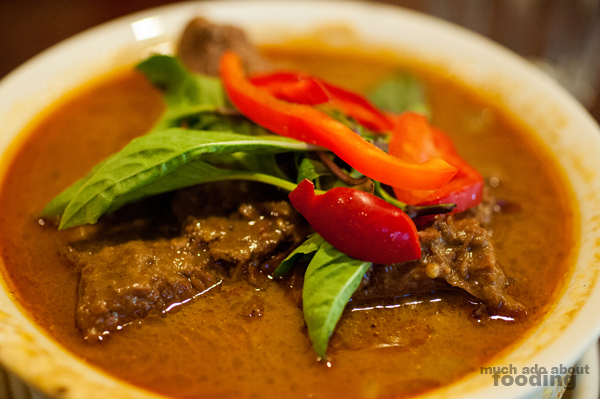 Another order was a bowl of their Beef Panang (แกงแพนงเนื้อ) which involved a beef-laden curry full of spices and soul. The beef was quite tender too but due to the juiciness of the meat and the accompanying curry, it needed to be had with rice. Good thing too because after having several bites of this, you'll realize that the salt creeps up on you. The final two dishes (well technically they all came out together but I'll write in the order that my pictures are posted) were the Chicken with Pepper & Garlic (เนื้อ/หมู/ไก่กระเทียมพริกไทย) and Pad See Ew (ผัดซีอิ๊ว - ordered with chicken), both of which were generally the table's favorites. When ordering, my friend referred to the chicken as just Garlic Chicken but I believe the above name is the one they list on their menu. It was crispy with fried minced garlic and plenty of seasoning. I found that despite how delicious the chicken was, I could have a few morsels at a time with rice because the salt got to me after a while. 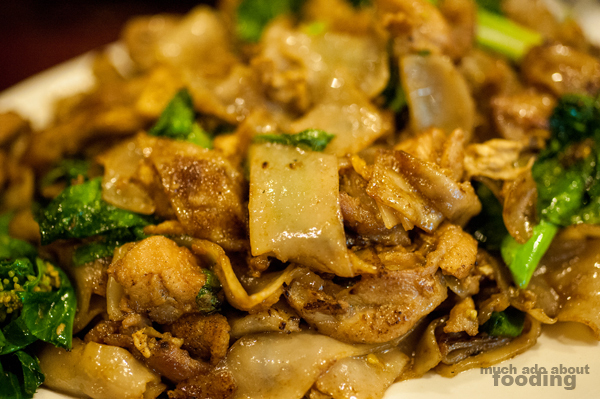 That's okay though because the noodles from the Pad See Ew become my buffer. This one still had the slightly burned marks on each noodle from the pan that made it all come together well. The sauce was applied just with the right amount of liberation to coat the noodles but not be overbearing. Overall, I know I'll be coming back to Thai Nakorn now that I've seen the light! Photography by Duc Duong because I was stuffing my face.